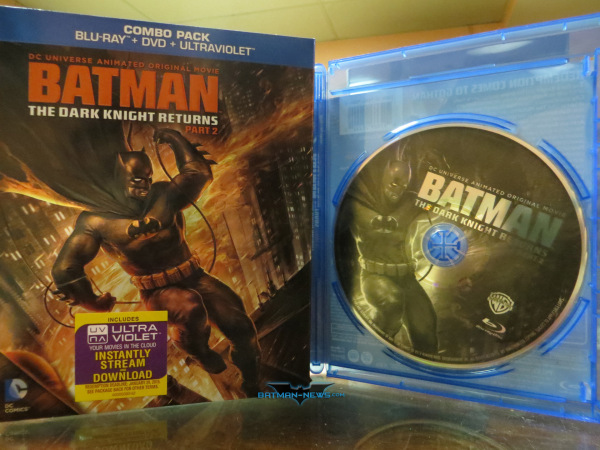 February 15, 2013 is last chance to enter to win Batman: The Dark Knight Returns Part 2 Blu Ray + DVD Combo Pack from The Batcave Toy Room. Just tell me where I got the phrase "Fangasmic" in the comment section below to enter. One hint: a character from this movie spoke the phrase. Just tell me who said it and when. The Dark Knight and the brave, young Carrie Kelly at his side as Robin have finally reclaimed Gotham City and allowed a ray of hope to penetrate the reign of terror that The Mutants cast upon their city. With Batman back in the spotlight, the extended media coverage has awoken a far worse evil at Arkham Asylum - The Joker! Destined to be Batman's mortal enemy, The Joker has a diabolical scheme that mat pull pull Batman down to the darkest levels of insanity. Meanwhile, on the horizon, a global catastrophe races towards Gotham, and with it comes a familiar face, the Man of Steel, though this time he has Batman in his sights. A returning voice cast, headed by Peter Weller, Ariel Winter, and David Selby, delivers the epic finale of this DC Comics legend. Watch as the aging Dark Knight wages a tireless war against crime while proving that courage and will are indeed timeless. For a review of this film check out Batman-News.